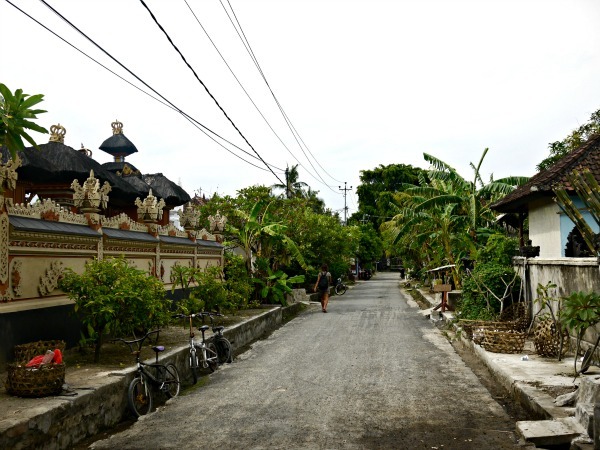 We’re planning on spending a total of three months in different parts of Indonesia, and our first stop was the island of Nusa Lembongan, just east of Bali. 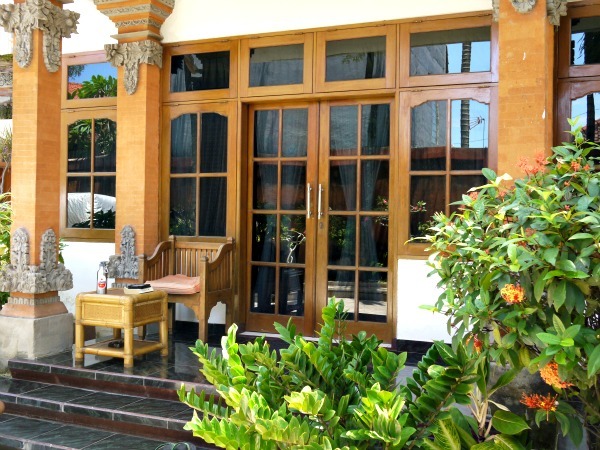 It’s a smaller, quieter, less developed place than south Bali. It’s so beautiful there! I fell in love with the place. 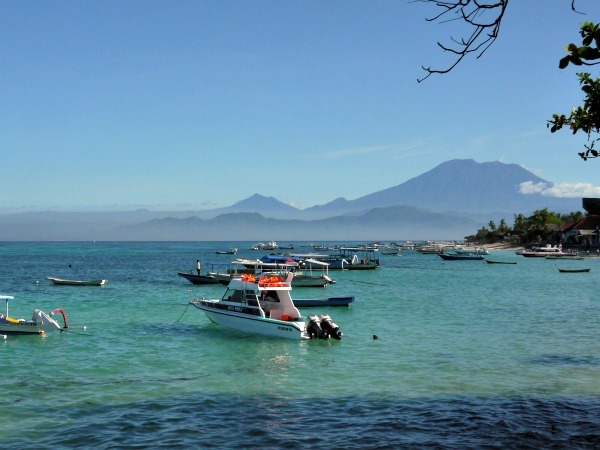 The water is crystal clear and turquoise, and on clear days, there’s a great view of Bali’s Gunung Agung, the highest point on that island. 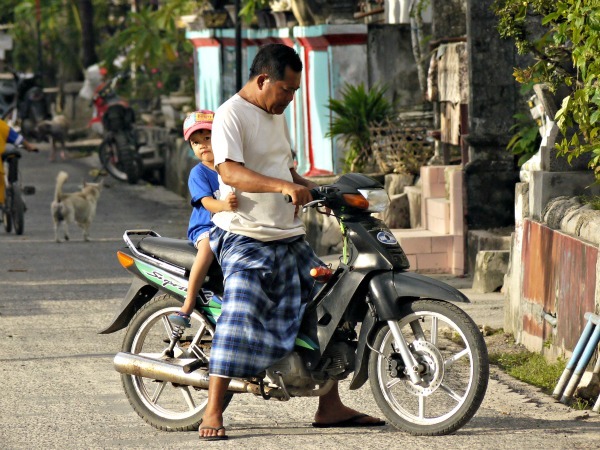 There aren’t many cars on Lembongan; people mainly use scooters to get around. Kids learn to be comfortable riding two, three or even four to a scooter from a young age. 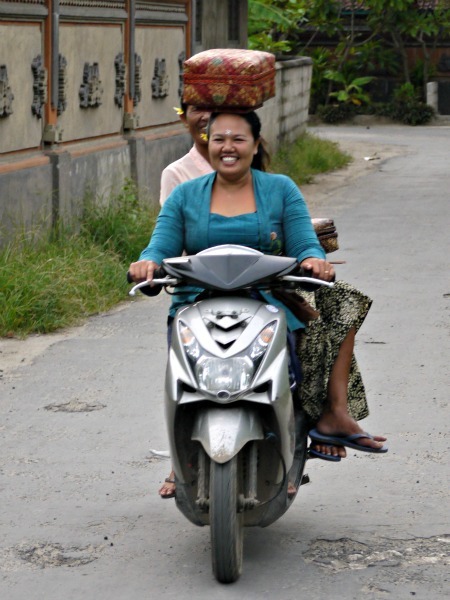 The local ladies were astonishingly good at balancing things on their heads. This lady below didn’t have anything holding that basket on her head! 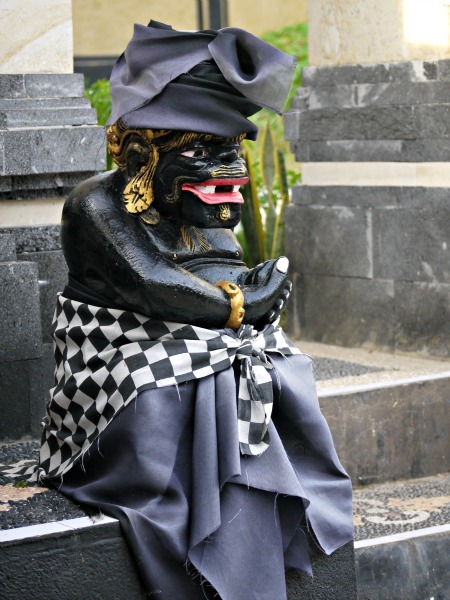 Bali is predominantly Hindu, but it’s a specific Balinese style of Hinduism that incorporates some Buddhist and animist beliefs. Religion and spirituality are a big part of daily community life here. 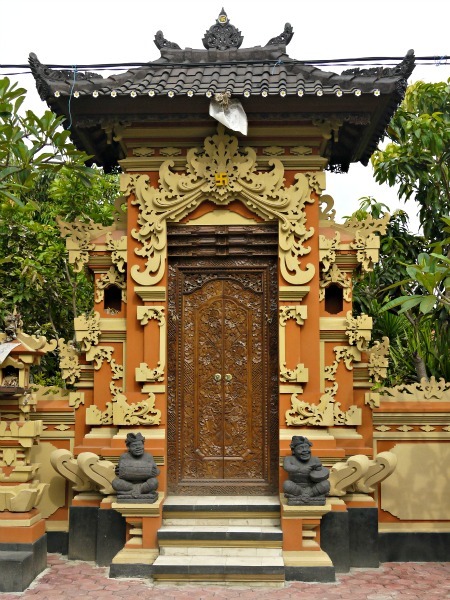 Temples abound, with elaborate details. 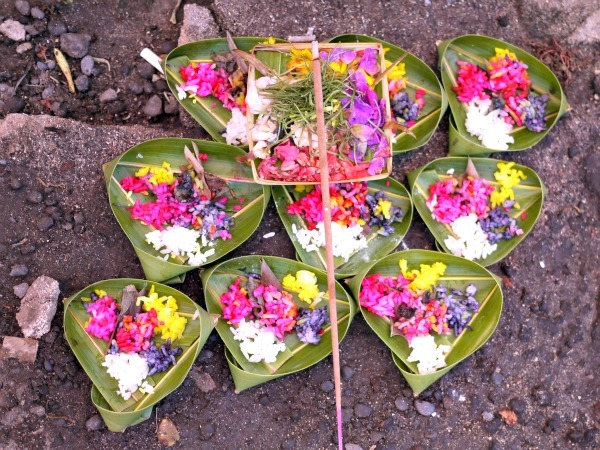 Several times a day, the Balinese Hindus prepare and put out little banana-leaf basket offerings in thanks to the gods. 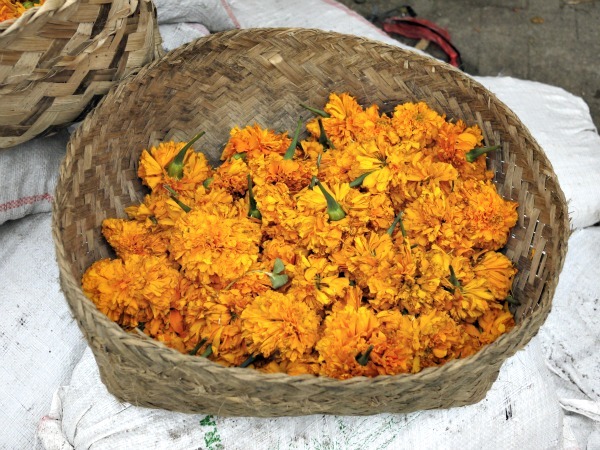 These canang sari contain items such as rice, flowers, crackers, candy and cigarettes. 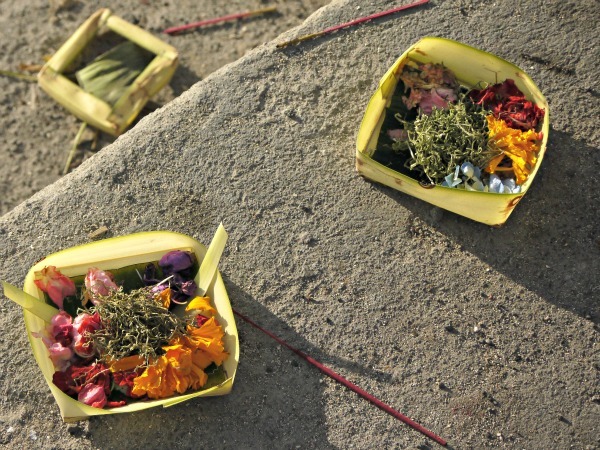 The offerings are everywhere you go, in the street and in front of household shrines. The banana-leaf baskets are cute and range from larger box shapes to tiny cones. 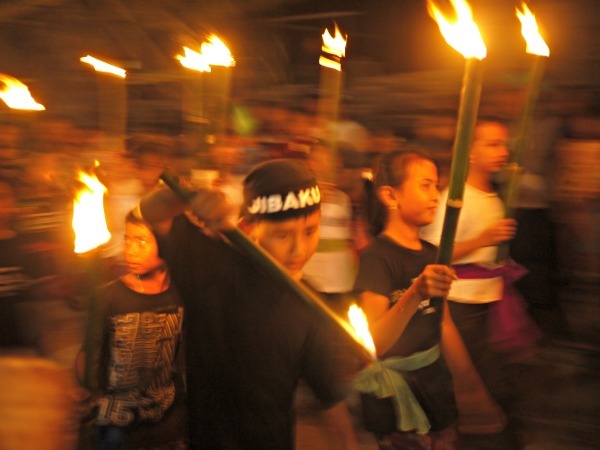 We happened to be in Lembongan for Nyepi, the Balinese New Year. 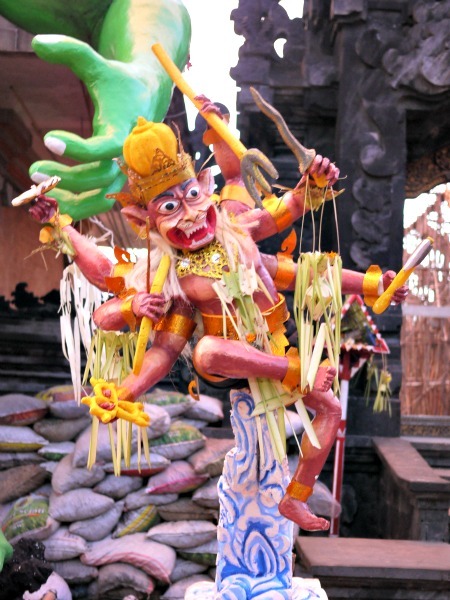 The day before Nyepi is filled with temple festivities. 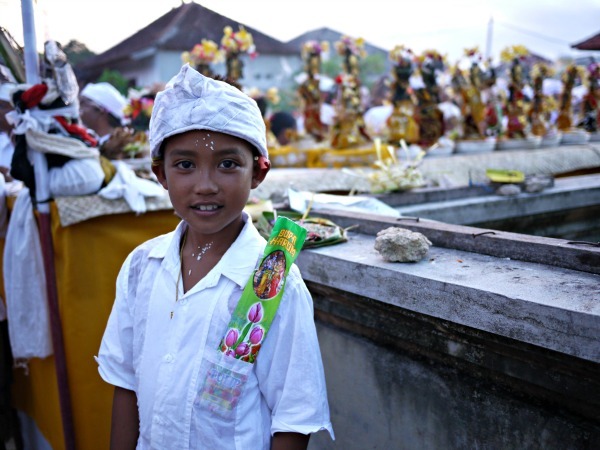 Women, men and kids are all decked out in beautiful, traditional Balinese dress. The kids were all just too adorable. 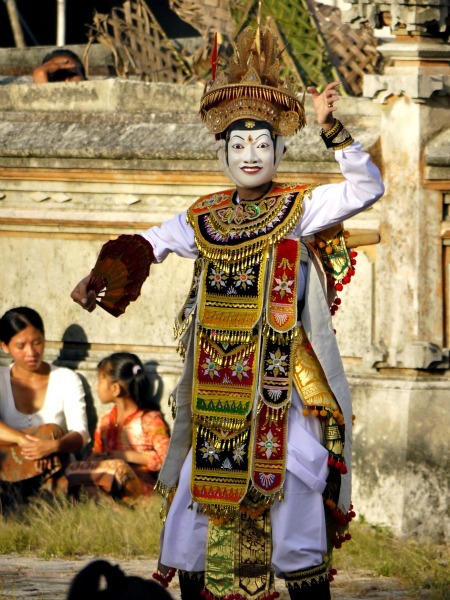 We happened upon a barong dance performance going on in one of the temples closest to our guesthouse. 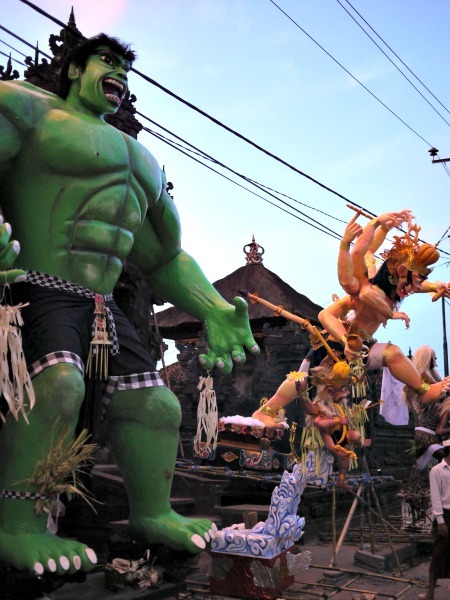 Later that Nyepi’s eve, the whole town is out on the street after dark for the ogoh ogoh parade, in which bigger-than-life statues of evil spirits are paraded around and made to mock-fight each other, in time to live percussion music. 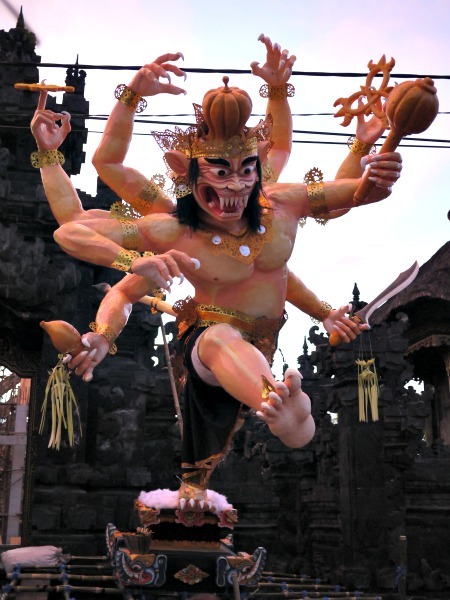 It was like a Balinese Kaiju Big Battel, in the street. 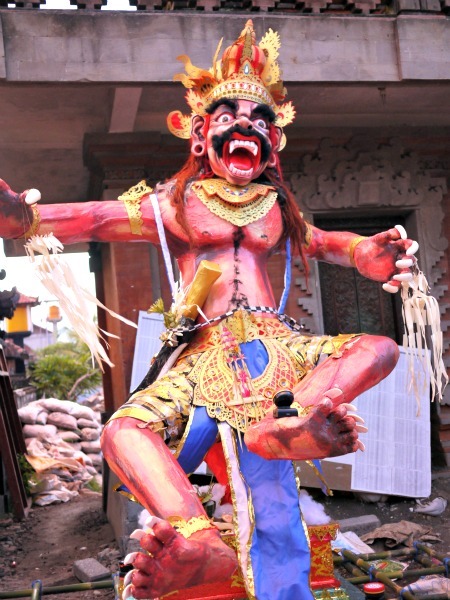 The people in each village spend their free time collectively building the giant demons in the weeks leading up to Nyepi. 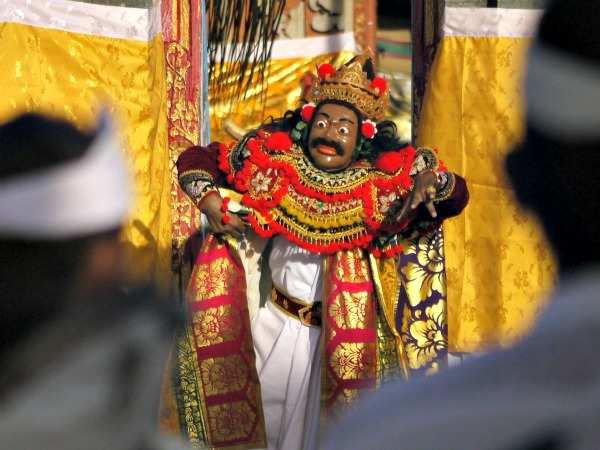 The actual day of Nyepi is a day of silence, in which no one is allowed to leave their house or hotel, or use electricity. Noise is discouraged. The gods must have been on our side, because that day was completely flat. We could see all three of Lembongan’s surf breaks from our guesthouse balcony, and would have gone out of our minds if the waves had been good! The tides are extreme around Nusa Lembongan, and when the tide goes out, the many seaweed farms that surround the island are exposed. 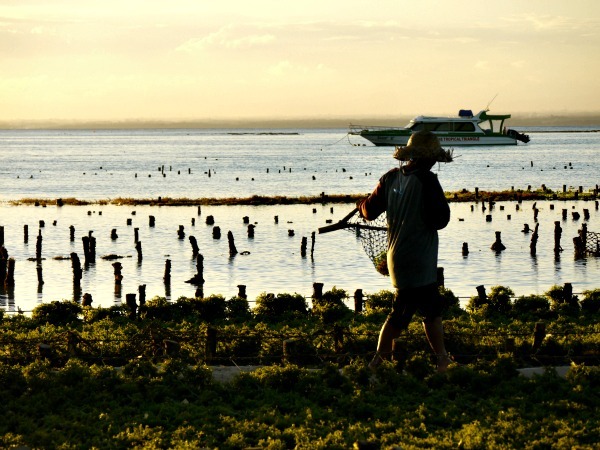 The seaweed farmers sell their crops to cosmetic and food companies. 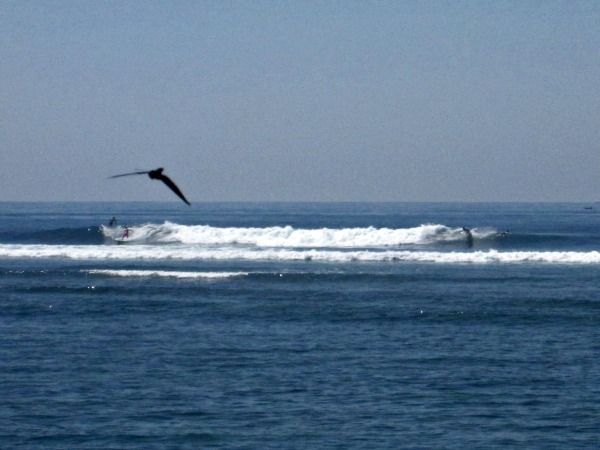 We surfed almost every day we were on Nusa Lembongan. The waves were very fun, and you could sometimes see the coral reef and colorful tropical fish swimming underneath you in the lineup. We also went snorkelling a few times, including a place called Manta Point, which is full of giant manta rays that swim right beside and under you. It was a truly incredible experience. 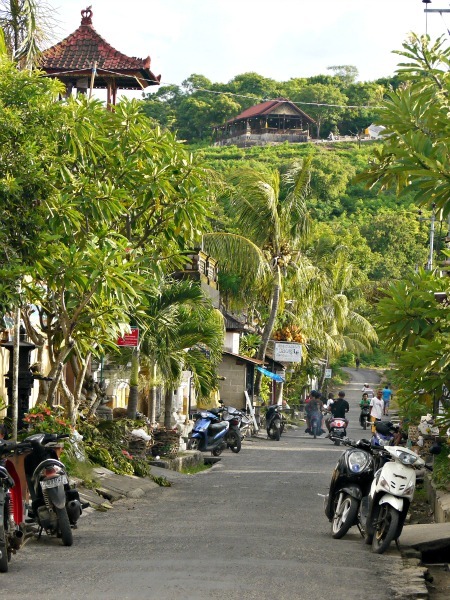 When our time was up in Nusa Lembongan, we took a boat back to Bali and decided to stay on the east coast, in the area of Sanur. 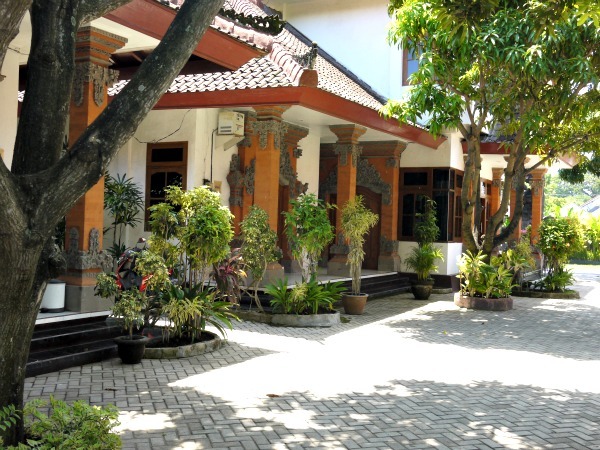 We found a great little homebase called the Bali Mille Homestay, where they gave us a good deal for two weeks in a giant room with air conditioning. What a luxury — air conditioning! We’ve had A/C the whole time we’ve been in Indonesia so far, and we know we’re going to regret the upgrade once we go back to slumming it with fan-only rooms. It’s usually around 32 Celsius everyday with high humidity. One of the great things about the Bali Mille is that we have a fridge, so we stocked up on yogurt and granola, and buy whatever whacky local fruits are in season. 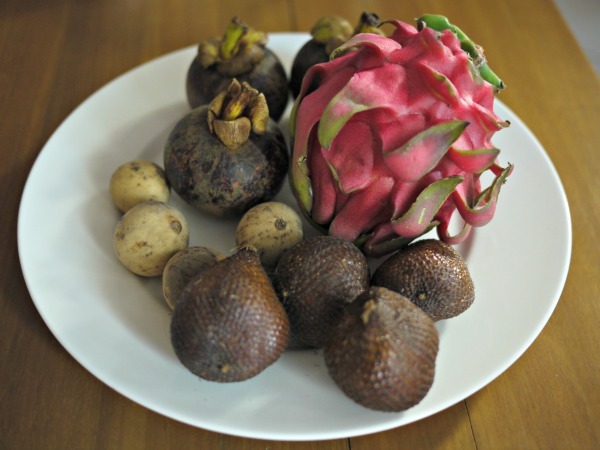 Below, clockwise from the pink fruit: dragonfruit, snakefruit, duku and mangosteen. All very interesting and very tasty. The waves have been great most days. I had a close encounter with the reef a little while ago. Don’t surf the Sanur reef breaks at low tide! ← Sri Lanka Safari And Surfing In Singapore! Ouch!. That’s for the last photo. Thank you for the effort you put into these journals. I feal that Im there. I love the phrase; a champagne home on a beer budget or something close to that. Its Easter Friday here at a remarkable 9 Deg C. Snow almost gone in the front garden with microscopic Tulips trying to emerge.Back yard still in the land of The Selfish Giant. Great to see that you guys are still living the dream! I met you at Lobitos last August and just came across your website randomly. I was traveling with two friends (Chad and JP), also from California. JP is in Bali right now. Don’t know if you ran into him there. It’s a small world when you’re on the surfing path! Safe travels.